Dawn of the Planet of the Apes is the second instalment in the rebooted Planet of the Apes franchise. The film, directed by Matt Reeves, follows on a decade after the events of the first film and finds Caesar and the apes in a secluded colony near the ruins of San Francisco. Having seen no humans in the two years preceding the film, the apes believe themselves to be alone and safe from the war and confusion created by the ALZ-113 virus. Their notion of security is shattered, however, when a group of humans stumble upon their home in search of a hydroelectric power source. Faced with the choice of protecting his home or ensuring peace by helping the humans, Caesar must decide how best to preserve the life he’s built. One noticeable element in Dawn is the almost stratospheric advancement in both the use and quality of motion capture technology when compared to its predecessor. Weta Digital, the brains behind Gollum, was the company in charge of creating and developing the apes in the franchise. 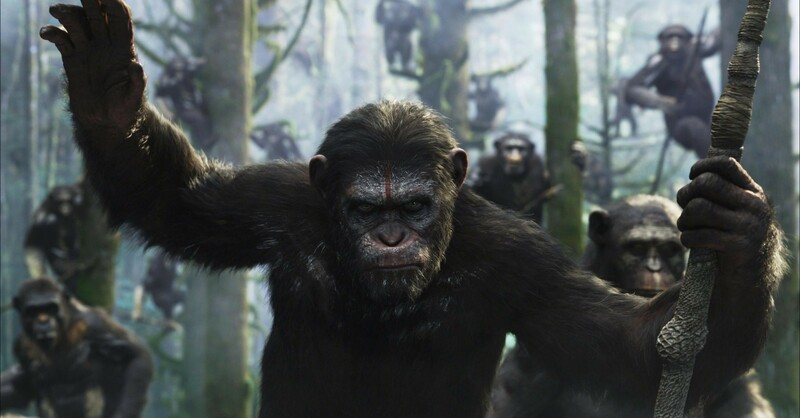 Already having set the bar high with Andy Serkis’s Caesar in Rise, they’ve now set it even higher in Dawn, with not only Caesar but a whole host of characters like Koba, Rocket, and Maurice. The detail that has gone into each and every scene is exquisite and is perhaps best illustrated by how the apes look and feel like real apes, despite being performed entirely by actors in motion capture suits. In an interview with Creative Bloq, Weta’s animation supervisor Dan Barrett discussed the extensive work carried out by the animators – pinpointing issues like the differences in bone structure between humans and apes, and what that meant in terms of the compromise needed to most effectively translate an actor’s movement and dialogue onto an ape’s face. This enhanced the cohesiveness of the characters and allowed the features of each actor to shine through the animated exterior. Another challenge Weta faced came with the introduction of different textures, such as the wet fur of the ape colony, and their success in overcoming the challenge of illustrating the effect of different elements was pivotal in creating the realistic visual experience that is this film. Perhaps the biggest difference between Rise and Dawn is the sheer number of influential characters in the latter. While Rise focuses almost solely on Caesar, Dawn expands the roles of the other characters, allowing room for greater development to the point that it was Koba that stole the spotlight in Reeves’s production, a feat achieved as a result of the incredibly raw performance by Toby Kebbell. Serkis and Kebbell’s performances are responsible for an intensity between the characters that creates an almost Shakespearean dynamic, and as their characters grow and develop it is their conflict with themselves and each other that is the driving force of the film. Possibly one of the most unsung members of the cast, however, is Terry Notary, whose chameleon-like ability to embody different personalities is the essential backdrop needed to highlight the roles of the lead actors. Despite being part of the prominent moments in the film, the human characters remained incidental, functioning only as a stepping stone towards the creation of the planet of the apes, and while audience responses to the 1968 classic were mostly sympathetic towards the human cause, in Dawn their struggle was clearly secondary to the apes. Of course no film is perfect, and although Dawn was intriguing and intense, the action was stereotypical for its genre and this detracted my enjoyment of the film. Moreover, the excellent structure of the film proved its own undoing as the earlier narrative and subtext combined with the progression of common tropes to make the outcome of the penultimate scene obvious to viewers. It is therefore to the film’s benefit that the importance of this scene lay not in the action but in the emotional turmoil faced by Caesar and the moral questions he, and the audience, were presented. Matt Reeves’s take on the planet of the apes franchise was bold in its expansion of the setting for Dawn, made more realistic by Weta’s successful tackling of the challenges this posed. These factors, combined with stellar performances by Andy Serkis and Toby Kebbell meant that Dawn succeeded in amazing and intriguing the viewers. While there are events in the movie that are predictable, the importance of this issue is next to none when compared to the development of the protagonists and the moral questions raised that ensure that Dawn of the Planet of the Apes is a joy to watch. I am impatiently anticipating the next instalment in the franchise.